A Fugitive from the Past (Tomu Uchida, 1965) – Make Mine Criterion! The Criterion Collection, a continuing series of important classic and contemporary films presents A Fugitive from the Past. Tomu Uchida’s allegorical crime epic stands among the masterworks of Japanese cinema and represents the apex of the director’s prestigious career. A deadly robbery committed during a massive typhoon and a criminal’s flight from the law culminates with a murder 10 years later and a revived police investigation. Set in 1947 during Japan’s harsh social conditions and the post-war economic miracle that arrived a decade after, Uchida’s film explores Japan’s traumatic past and the karmic penance that refuses to be denied despite newfound prosperity and good intentions. Mixing the police procedural subgenre, the fugitive-on-the-run plot, and emotional melodrama with mesmerizing, high-grain cinematography and solarized images, A Fugitive from the Past is Uchida’s tragically noir-infused magnum opus. Tomu Uchida’s masterpiece would arrive late in his filmmaking career (more than 35 years into his work as a director) and a decade beyond his return from Manchuria. Adapting Tsutomu Minakami’s 1962 novel Kiga kaikô, Uchida’s A Fugitive from the Past (also known as Straits of Hunger, Hunger Straits, and Starvation Straits) offers a figurative tale of past crimes and their near metaphysical demand for redress. In doing so, the film points to the traumas of World War II and the suppression of their memory in the heydays of Japan’s “Golden Sixties” and the nation’s continued economic miracle. While prizing no individual character, A Fugitive from the Past is not quite the ensemble piece like Bloody Spear on Mount Fuji, preferring instead to methodically intercut related individual narratives and present blocks of interaction where these narratives converge over an extended period. What is constant throughout the film’s carefully drawn out 3-hour running time is the oppressive and threatening pressure of time – the guilt of the past, the danger of the present, the uncertainty of the future. A Fugitive from the Past opens amid the true-life typhoon that struck the southern shore of Hokkaido in 1947. Two men flee a burning shop in Iwanai to meet Takichi Inugai (Rentaro Mikuni) who waits at a nearby train station. They are eventually forced to steal a rowboat to cross the Tsugaru Strait during the chaos of a sinking ferry, the Sounmaru. By morning, emergency responders discover two extra bodies among the ferry’s victims (Iwanai’s confederates) and local cop Yumisaka (Junzaburo Ban) takes after the trail of the large, bearded man seen with them. Inugai finds much needed help in a simple-minded and caring prostitute named Yae Sugita (Sachiko Hidari) and he leaves her ¥30,000 of the stolen ¥800,000. When Yumisaka traces Inugai to Yae’s brothel, Yae throws the detective off the fugitive’s trail, then uses her recently acquired nest-egg to move to Tokyo in search of a better life. Set 2 years after the end of World War II, the first half of A Fugitive from the Past manages to consistently evoke the wartime spectre of a desperate Japan. Inugai and his partners are uniformed as returned servicemen and Iwanai resembles a war-zone between the typhoon, the spreading fire blown through the town by high winds, the thick smoke, and the numbers of citizens and first responders dealing with the fire and sinking ferry. Uchida compliments these chaotic scenes with a roving and shaking camera fraught with the tension of wartime. Even once the disorder of the typhoon is concluded and the film shifts to Inugai’s flight, Yumisaka’s investigation, and Yae’s life in Tokyo, this probing, wavering cinematography persists, carrying over the same uncertain sensibility. Yae’s struggles in Tokyo dominate the latter part of the initial 1947 section of the film, focusing on the scarcity of basic goods and rise of black marketeering, as well as the plagues of gangsterism and violence. The shooting style of this section connects it back to the tumult of the film’s opening, however Uchida settles into a more staid approach when A Fugitive from the Past quietly advances a decade, finding Yae working happily and comfortably in a small, family-run brothel. Ten years after Inugai left Yae with a small fortune in cash, she is happy and reasonably secure, still working as a prostitute at the same brothel (although the government will shortly outlaw prostitution in a few months). Yae happens upon a picture in a newspaper of a wealthy businessman named Tarumi Kyoichiro who has donated ¥30,000 to assist in the reintegration of prisoners. Convinced that Kyoichiro is the Inugai she briefly met years earlier, she travels to his home to thank him for his past generosity. Kyoichiro initially denies Yae’s assertions but her belief is confirmed when she recognizes Inugai’s deformed thumb. Kyoichiro crushes Yae in a mad embrace, then kills his assistant when he finds Kyoichiro with Yae’s body. Kyoichiro plants their bodies in an effort to pass their deaths off as a double suicide. The police are unconvinced, unable to connect Yae and Kyoichiro’s assistant. Yae’s father remembers Yumisaka, who is brought into the investigation, and further pressure is applied to Kyoichiro, leading to a fraught interrogation and a stunning and abrupt conclusion. History is inescapable in A Fugitive from the Past. Whether it is Inugai’s guilt for his part in the robbery or the gratitude he is owed for his gift to Yae, the past hangs over him in the present with a karmic weight that cannot be relieved with denials or donations. As Inugai travels alone from Iwanai, he comes across a funeral and a terrifying itako, a priestess channeling the voices of the dead. Beneath Mount Dread, the mountain that lets the dead speak, Inugai meets Yae and, deathly afraid of the dead’s voices, finds an opportunity to outrun his past, although only temporarily. Uchida’s evocation of Japan’s wartime trauma suggests that its aftermath still exists, as even the dead won’t remain silent, and will persist until confronted directly, and this partly explains how A Fugitive from the Past is sometimes considered a work of the Japanese New Wave. Tomu Uchida is certainly an unlikely figure to rub shoulders with the daring young filmmakers of the period, as his career dated back to the silent era and as he was pushing 70 when he made A Fugitive from the Past, but there is an audaciousness present in the film that distinguishes it and makes it his masterpiece. In addition to its thematic engagement with a troubling history, A Fugitive from the Past is presented in a grainy 35mm blown up from 16mm and is boldly punctuated with solarized images in key moments of emotion, concentration, and insight. Ostentatious and unnerving, these negative images appear like glimpses into an underworld, into the darkness that hides beneath the everyday, into the suppressed rot that is only suspected beneath the surface. It is a bold and epic tour de force that is perhaps only achievable by a filmmaker who lived through Japan’s dark days in Manchuria and who replaced his nationalism with a full appreciation of the contradictions that shape his homeland. Aside from being domestically considered one of Japan’s greatest films and Tomu Uchida being filmmaker in need of a much greater presence on hard media in the West, A Fugitive from the Past deserves release with Bloody Spear on Mount Fuji in part for how well the two films compliment one another. 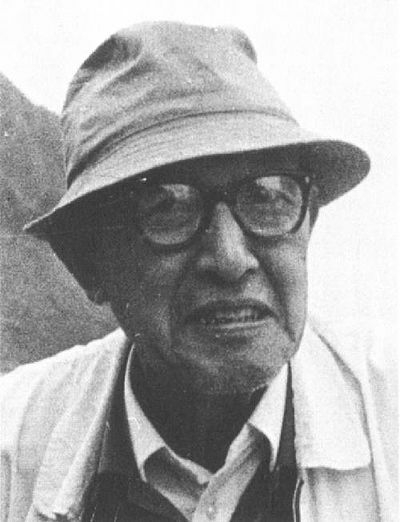 The two masterworks essentially bracket Uchida’s return to cinema and demonstrate his ambivalent attitude toward his country’s national character, both as it exists in the present, as it evolves over time, and how it is developed out of the past. Both are historical in nature, one involving a far more recent context than the other, yet employ notably different cinematic and narrative strategies. The Criterion Collection has always been a label that relied on the notion of auteurs, and this pairing of Uchida films would allow for an introduction to the esteemed director that would demonstrate the themes and preoccupations of his second career in cinema. And while we have spent much of our time celebrating Uchida the filmmaker, A Fugitive from the Past collects brilliant performances throughout, particularly those of Mikuni, Hidari, and Ban who play their characters with an honesty and sincerity that is entirely moving. One cannot help but be gripped by Yae’s compassion, Yumisaka’s modesty, and Inugai’s painfully suppressed emotions. For many, A Fugitive from the Past represents Rentaro Mikuni’s finest performance. We again propose another two-person art studio to provide a cover treatment to this imagined Criterion release – Dan Black and Jessica Seamans’ Landland. 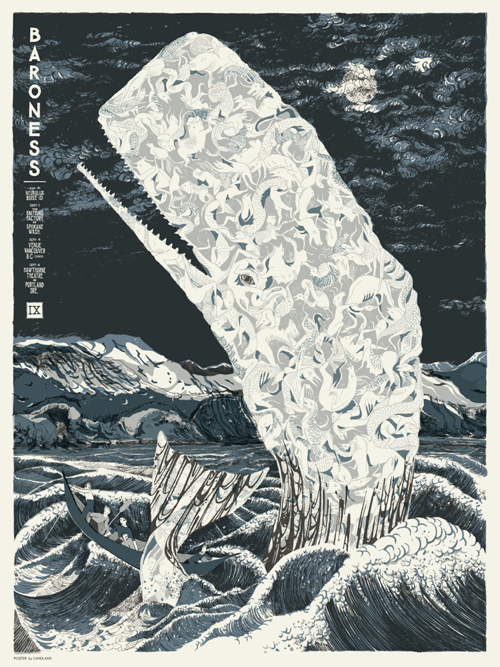 One look at their Baroness Summer 2013 poster (which also appears in an alternative version print – “The Wanton Sea”) and we were convinced, what with the work’s eerie sky, its roiling waters, its forbidding mountains, and the allegorical image of the collective whale made from other creatures. There is something reminiscent in the piece to a Japanese woodblock print and the image of a sea beast fashioned from smaller animals evokes a history of death returned once more for recompense, bringing to mind the sinking of the Sounmaru, of the small boats that went out to save them, and the terrible past that Inugai cannot escape. Previous Article Film Fest Envy! A fugetive from the past. When is this one comming to blu ray release? No idea. While it looks like there may be a good DVD edition from France, Bluray.com doesn’t show any blu-rays for this or any title by Uchida. Pingback: The Temple of Wild Geese (Yuzo Kawashima, 1962) – Make Mine Criterion! Pingback: Arrow Made Mine! The Bloody Spear at Mount Fuji Edition – Make Mine Criterion!